you must go deep within yourself. On observing noteworthy phenomena which we can’t yet explain by known natural or scientific laws, we sometimes call them “miracles” and may attribute them to a Divine power. In prior memoirs, I’ve explained how Guruji has helped me from subtle planes, like a ‘guardian angel’, since before I met him when his body was approximately one hundred years old, and even after his supposed bodily death in India sixteen years later. I believe that Guruji left his body consciously and intentionally, using his yogic powers; that Guruj’s subtle bodies survived the physical body; and, that from subtle planes he continues to help humanity. I’d like to explain to you my reasons for this belief. Why Guruji Survived Supposed Physical Death. In the Hindu tradition, when a yogi who has previously experienced the highest state of samadhi intentionally leaves his body, this is not the same as death of an ordinary person who has not attained Self-realization. Such a passing is called a Mahasamādhi (great and final samādhi) and is the act of consciously and intentionally leaving one’s gross body at the time of physical death. Before I received shaktipat initiation from Guruji in 1978, I had already witnessed his yogic power to influence this relative reality from subtle planes. He had clearly appeared in my subtle inner vision when we were physically distant. Thereafter, I had other memorable experiences of Guruji’s subtle powers, which are shared in other memoirs chapters. Also, at Guruji’s meditation programs, I heard amazing stories from others who had experienced his extraordinary yogic powers. Perhaps the most memorable of these stories was that of Rudy, a Chicago school teacher who decided to travel on his motorcycle to be with Guruji in California. But before reaching California, and while he was in Colorado, Rudy had an unexpected and “miraculous meeting” with Guruji. Gravely injured, Rudy became comatose. While comatose he had a miraculous “near death experience” (NDE), which he survived and later recounted in detail. On ‘the other side’ during the NDE, Rudy was greeted and guided by Shri Dhyanyogi, to save his life. Thereafter, at a California retreat, Guruji explained to Rudy that he had saved his life because Rudy still had much more work to do in this world. Rudy’s vividly credible description of this amazing incident was convincing testimony of Guruji’s yogic power to influence what happens in this relative “reality”, and to manifest at will on subtle planes of “reality”. Besides my own extraordinary experiences with Guruji, and hearing of Rudy’s experience, I learned of numerous other “miraculous” experiences of Guruji’s devotees. My Experience in San Francisco on Guruji’s Mahasamadhi in India. One of my most memorable mystical experiences of Guruji’s yogic powers happened just after he left his physical body in India and I was at home in San Francisco. In late August, 1994, I was home asleep when I was suddenly awakened in the middle of the night. 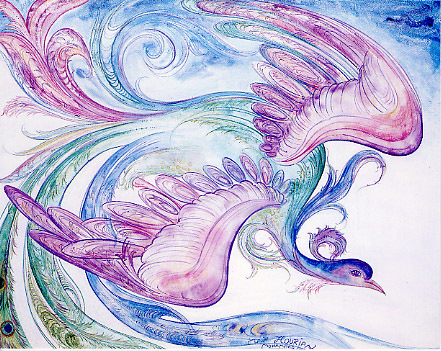 With eyes open, I beheld in amazement an extraordinary and unprecedented vision – an otherworldly, multi-colored bird, translucent with a peacock-like tail and human-like eyes. Nothing about the bird appeared like any ‘real-life’ bird I had ever before seen, or might have imagined. The next day, still wondering about the vision, I was sitting at my dining room table when an ‘inner voice’ dictated to me a poem concerning death, a subject I hadn’t then been thinking about. And we really don’t go. Thereafter, within a day or two, I received a rare call from one of Guruji’s early US disciples, Elyse (Indu) of Sacramento. She informed me of Guruji’s death – his Mahasamādhi – on August 29. Only then did I realize that I had received this poem (about life and death as a waking dream) as a ‘parting’ profound message and treasured gift from Guruji. So I recited the poem for Elyse. Then I told her about my puzzling otherworldly bird vision. She promptly and aptly interpreted that vision as a mythical Phoenix bird, symbol of immortality, resurrection, and life after death. Whereupon, I realized that the bird’s dark human-like eyes emanating ineffable supernal Peace were Guruji’s eyes; and, that this unforgettable vision and experience of celestial peace was another parting gift and message from Guruji, for which I am eternally grateful. Almost twenty five years have passed since that miraculous experience of Guruji’s Mahasamādhi, but I still continue to feel his subtle presence and often shed tears of devotion and joy, when I think of him or gaze at his photographic image. And other devotees entering my high-rise hermitage have also experienced his life-force energy (shakti). Almost twenty years after Guruji’s transition, I had a home visit from my friend Michael O’Rourke, a talented spiritual cinematographer who helped me launch SillySutras.com. I was telling Michael about Guruji, and feeling his subtle presence, while seated in a reclining chair. After a while I had to excuse myself for a bathroom visit. When I returned several minutes later Michael reported to me his extraordinary experience of Guruji’s subtle appearance. While Michael was gazing at me as I talked about Guruji, he went into an altered state of consciousness. 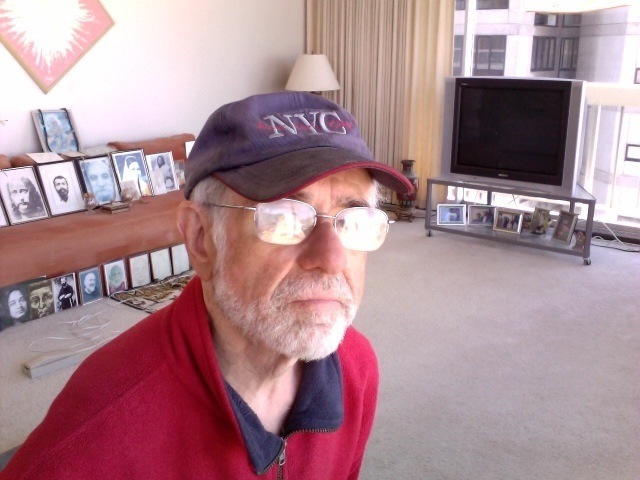 Michael then perceived another face morphing into mine – a face without glasses and with a longer white beard. It was Guruji! Michael said that amazingly after I got up to go to the bathroom he still perceived the image of Guruji seated in the chair, until after I returned and sat down again. “All those who came to me for Shaktipat …. are my spiritual heirs. Not only were Michael and others blessed by Guruji’s extraordinary energy in my apartment, I believe that (like he blessed Rudy) Guruji saved my life while I was comatose and near death after a taxicab rundown in June, 2014. (See https://sillysutras.com/another-near-death-experience-rons-memoirs/) So that it is only through Guruji’s grace that I have miraculously survived to gratefully still share these memoirs. May those reading these stories receive Guruji’s continuing blessings, notwithstanding his Mahasamādhi almost twenty five years ago. Oh Beloved, where is the Beloved? As explained in other memoirs chapters, during a traumatic 1976 divorce I experienced a transformative mid-life spiritual awakening. Two years later, I met a one hundred year old Hindu guru, Shri Dhyanyogi Madhusudandas, and evolved from being a secular Hebrew, to becoming a “born-again Hindu”. And thereupon I developed an ever increasing interest and curiosity about Indian spirituality and culture. After a few years, the “universe” presented me with an ideal opportunity to satisfy that curiosity. 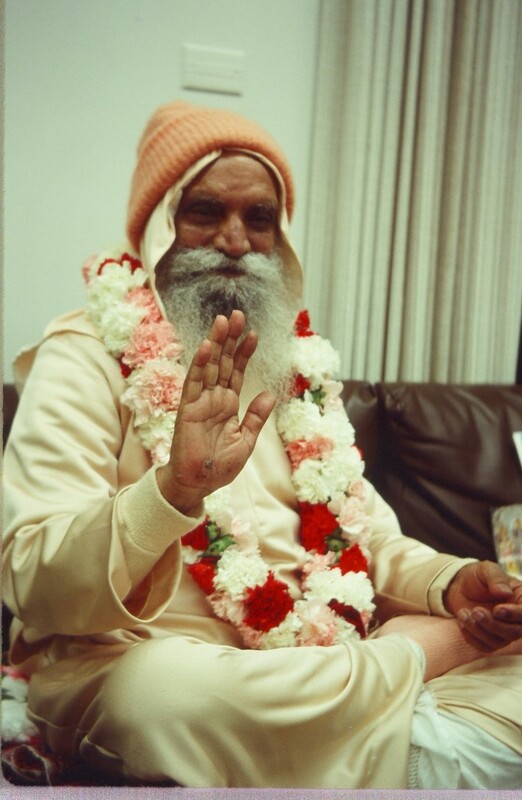 In 1981, soon after my beloved Guruji, Dhyanyogi, had returned to India, I met Sant Keshadavadas, a devotional Indian spiritual teacher known as a singing saint. Thereafter, on learning that Sant Keshadavadas would be conducting a spiritual tour of Indian holy places, I wanted to join that tour, if it was okey with Guruji. Guruji had always told us that it was not necessary to see other spiritual teachers, but permissible. So I succeeded in getting his approval for me to tour with Sant Keshadavadas. Thereupon, in January and February 1982, I journeyed with Sant Keshadavadas on a wonderful spiritual pilgrimage to Japan and India. That guided tour was, and remains for me, the most important trip of my lifetime. Never before had I been in a land with such a palpably spiritual ambiance as I experienced everywhere in India. Throughout the tour I was constantly seeking to learn how I could best advance my quest for “enlightenment” – my spiritual “sadhana”. By the time that the guided tour ended in New Delhi, I was quite weary from following the intense tour schedule. But I was determined to remain in India to pay my respects to my beloved Guruji, and to receive his guidance and blessing for my “sadhana”. Here is the story of what happened. 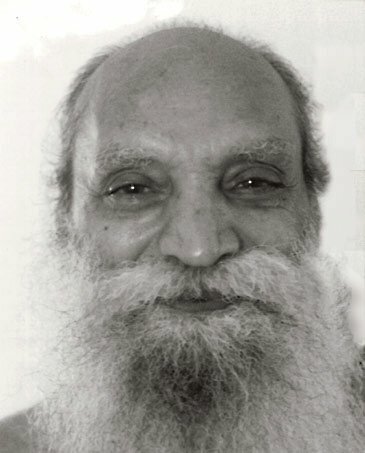 After four years of tireless efforts in the US, Guruji had become extremely debilitated and was obliged to return to India in 1980 to recuperate. After his arrival in India, his whereabouts were sometimes kept confidential so he could rest and recover without constant interruption. 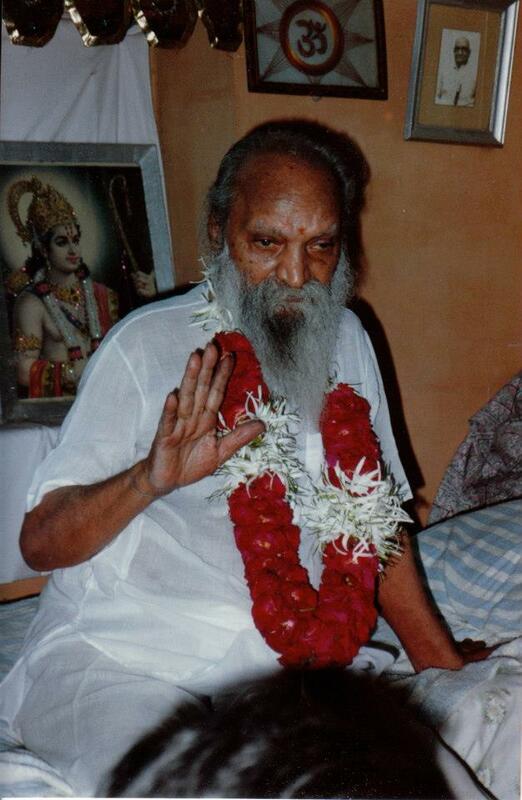 Before I departed for India in January 1982, I was told that after my guided tour ended I would be able to learn Guruji’s whereabouts by calling Shri Anandi Ma’s father, Pundit Pravin Jani. And I was given his Bombay phone number. Over a month later, just before our guided tour ended in New Delhi, I began trying to phone Pravin Jani – who was in Bombay – from my New Delhi hotel. In those days India had not yet joined the digital communication age, and surprisingly I could never get a long-distance telephone connection from Delhi to Bombay. After repeated unsuccessful attempts, I decided to make a brief trip to Katmandu, Nepal to see Buddhist and Hindu holy places there. But, I remained determined to see Guruji. So on return to Delhi from Nepal, I again repeatedly tried calling Bombay to learn his whereabouts. But I was still never able to get a long-distance telephone line from New Delhi to Bombay. So I had to book a flight across all of India from Delhi to Bombay, so that I could then make a local Bombay phone call to Pravin Jani. Only by so flying to Bombay was I finally able to reach him by telephone. Whereupon he readily told me that Guruji was then staying in Godhra a small town not far from Ahmedabad, the largest city in Gujurat state. Paradoxically, my flight from Delhi to Bombay had overflown Ahmedabad long before it reached Bombay. If I had known Guruji’s whereabouts while in Delhi I would have flown directly to Ahmedabad. But that hadn’t happened. So, it was now necessary for me to book a flight from Bombay to Ahmedabad, and to arrange ground transportation from there to Godhra. But I then learned that the only flights to Ahmedabad had been cancelled, and that I could only get to Godhra by train. So, I needed to take an eight hour trainride from Bombay to Godhra, and learned of a departure later that day. Thereupon, I promptly took a taxi to the Bombay central railroad station where I arrived less than an hour before the train was scheduled to leave. At the station ticket booth, I was told that no first class train compartment was available; that only non air-conditioned second class space was available for the long trip. With no other choice, I attempted to purchase a second class ticket using my American Express dollar travelers checks or credit card, which until then had been accepted everywhere I traveled in India. But they were both rejected by the train station cashier, who told me that they only accepted rupees, which I could get at a nearby American Express office in downtown Bombay. Hurriedly, I left the train station and on the sidewalk asked the first knowledgable looking person I encountered if he could direct me to the nearby American Express office. Instead of telling me he couldn’t help me, he pleasantly and unequivocally told me where to go. I quickly followed his directions, which turned out to be completely wrong. Frantically, I finally got proper directions which I speedily followed. Arriving at the American Express office soon after it had opened, I obtained necessary rupees from a very lackadaisical clerk and rushed back to the central station, arriving just as my train was scheduled to depart. At the last minute I purchased a ticket and boarded the train just before its departure. Up to then my body – already quite weary from over a month of intense travel and last minute stress in getting directions to Guruji – had been running on extra adrenaline. But on boarding the train I soon realized that I needed to rest. However, that proved difficult. The seating was not very comfortable, my compartment companions were not quiet, the sultry temperatures required that we keep windows open to outside disturbances, including noises from many interim station stops. So my first long journey on an Indian train proved very interesting, but not restful. On disembarking at Godhra that evening I was quite travel weary but excited at the prospect of seeing Guruji again for the first time since he left my San Francisco apartment in 1980. I called the Godhra phone number given me by Pravin Jani and was courteously welcomed by one of Guruji’s hosts, a woman lawyer. I learned that Guruji was convalescing at the home of her father, a retired judge, and that I could see him for a short while at an appointed time the next morning. That night I stayed at a Godhra guest house in a very warm room with a mosquito netted bed. Because of heat and bugs, I did not sleep soundly. But nonetheless I awakened with great excitement about my imminent satsang* with Guruji. A few hours later I arrived at the judge’s house where Guruji was staying. There I was pleasantly greeted and told that Guruji was then in the garden, but that he would soon come in to greet me. I was brought into a lovely room with an altar and fresh cut flowers and an empty prominent throne-like seat for Guruji. As I waited there, my ‘monkey mind’ became quite active. Despite all of my wondrous experiences during the pilgrimage tour, I was busily dialoguing with “the voice in my head” about questions for Guruji. So when Guruji came into the altar room and sat down in front of me, I was feeling far from peaceful. But I sat there quietly gazing at him, waiting for him to entertain my questions. Though Guruji looked physically healthier than when he had been carried out of my apartment to return to India, he still looked quite fragile and much weaker than when I first met him four years earlier. But he was emanating indescribably intense ‘shakti’ life-force energy, which seemed as strong as ever. His aura was so extraordinarily powerful that it soon transformed my previously agitated state of mind. As I sat there I began harmoniously resonating with Guruji’s supernal ‘shakti’ life-force and felt more and more peace of mind. And so “the voice in my head” stopped ‘talking’ and my previous questions for Guruji gradually seemed to melt into silent infinite awareness. But they didn’t all dissolve. So after sitting there in silence for a while, I asked Guruji a preliminary question. But he kept gazing at me without answering the question, and remained silent. Whereupon, supposing that he might not have understood me, I asked Guruji another question. But he still remained silent. Since 1982 by faithfully following my beloved Guruji’s emphatic instructions and blessing for me to “meditate regularly” I’ve been learning about living with a stilled mind. In 1996 (after Guruji’s 1994 mahasamadhi and during an extended post-retirement period of reclusion), I was inspired to compose this poem “In Silence Sweet”, which only hints at Guruji’s profound blessing bestowed in that unforgettable silent ‘satsang’. Following shaktipat initiation from my beloved Guruji – Shri Dhyanyogi Madhusudandas – I learned that many of my new subtle energy perceptions were experiences of what Hindus call “shakti”. Since those memorable subtle energy experiences have often related to people from or places in India, in describing them here I use the Sanskrit word “shakti””. But first I’ll tell you what I mean by “shakti”, regardless of other possible definitions, since other cultures have other words to define such subtle energy. Here “shakti” means universal consciousness manifesting as primordial life force – or subtlest vital energy. In the human body it is often called “Kundalini” or “Kundalini-Shakti”. However, as used here “shakti” life force is not confined to the human body – but is omnipresent in this ever impermanent space/time reality. On meeting Guruji, I was immediately impressed with his extraordinarily powerful emanation of cosmic life-force “shakti”. And I learned that it was independent of his physical vitality, and even his physical presence. Moreover, I learned that Guruji not only emanated intense shakti but that he was one of those rare yogis who could intentionally transfer it to others not only by touch, gaze, or mantra sound, but also by thought. Thus on occasion I experienced Guruji’s shakti when not in his physical proximity. And I have experienced intense shakti emanating from Guruji’s body even when it was very weak. While Guruji stayed at my apartment in 1980 just before returning to India, his body was exceptionally weak and his physical vitality exhausted. He was so weak that he had to be carried out of my apartment to the vehicle bringing him to the SFO International airport. But his cosmic shakti energy was as strong as ever. Afterwards, I soon discovered it was so intense that even non-animate objects touched by Guruji had become imbued with it. While at my apartment Guruji slept at night on a large mattress brought here from the Soquel ashram. During days he often sat on a living room sofa looking out at the panoramic view of San Francisco Bay. A day or two after his departure I helped carry Guruji’s mattress out of my twelfth floor apartment, via elevator to a devotee’s van parked in the basement garage to be returned to the ashram. After only a few minutes of clutching Guruji’s mattress, I became tremendously “enshakticated” – intoxicated merely by proximity to Guruji’s cosmic life-force which had amazingly permeated the mattress, rather than by ingesting some inebriating or hallucinogenic substance. After that amazing experience with the mattress, I realized that my living room sofa where Guruji had sat had been transformed to be a holy relic imbued with his shakti. So I made it an altar. Afterwards for over thirty years I worshiped, prayed, cried and meditated at that altar, and no one sat on it. But sensitive guests and I felt Guruji’s holy energy still radiating from it. From those talks, I learned that even when Guruji’s physical body was apparently lifeless it continued to emit such extraordinarily intense shakti that several people had been rendered unconscious by it on trying to revive Guruji. So on returning to his body, Guruji had to revive them. Elsewhere I’ll tell you about memorable encounters with Guruji in India and after his 1994 “mahasamadhi” further showing that Guruji’s extraordinary emanation of cosmic life-force “shakti”, was independent of his physical vitality, and even his physical survival. Especially during and since my 1982 “trip of a lifetime” spiritual pilgrimage to India, I have been blessed with many more “enshakticating” experiences, not only with Guruji but with other holy people and places, which have confirmed the transcendent power of cosmic life-force shakti. I don’t recall all of those numerous experiences. But I will recount a few which were most memorable. On arriving in India in 1982 (four years after receiving shaktipat) I still knew very little about Indian spiritual culture and its many saintly beings, other than my beloved Guruji. But during the marvelous guided pilgrimage tour with Sant Keshavadas I had numerous unforgettable experiences from which which I learned much. One of the most amazing of such experiences happened near Sri Anandamayi Ma (“Blissful Mother”) – perhaps the best known Indian woman saint of the 20th century. Despite her prominence I hadn’t heard about this saint before this experience. But since then I can’t forget her. Though in February 1982 Anandamayi Ma was very feeble and ill, and just a few months from her August 27, 1982 mahasamadhi, she agreed to give darshan to our group of spiritual pilgrims at her home in the Indian holy City of Haridwar by the Ganges. As our tour van approached her residence in the Kanikhal district of Haridwar I began to experience intense shakti life-force energy even before we reached her house. It seemed as if her shakti had permeated the whole neighborhood. When we arrived at the saint’s residence we were obliged as a large group to remain outdoors, awaiting her appearance. Finally we were granted her darshan – viz. reverent sight of the divine mother of bliss. Like Guruji on his departure from my apartment, Anandamayi Ma’s physical body was so weak and infirm that she had to be carried out and held by a devotee while she bestowed her eternal blessings upon us. Yet her emanation of indescribably intense shakti was totally independent of her lack of physical vitality in a sick and painful body. 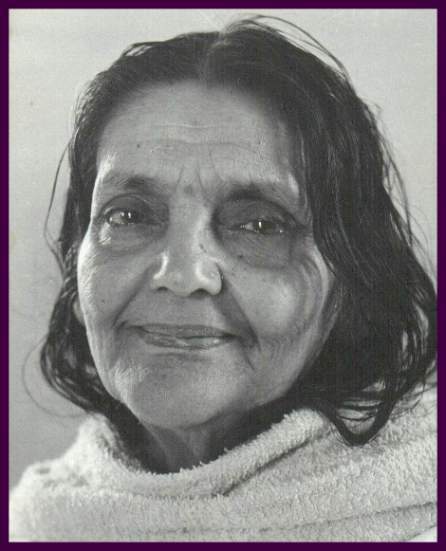 As a Divine Being who was temporarily inhabiting a then decrepit physical form, Anandamayi Ma was in no way self-identifying with that form, but only with her true nature – SatChitAnanda – Eternal Truth Existence and Bliss. From birth she had not identified with her physical body – but only with her eternal spirit. A description of her extraordinary state of being can be found in Paramahansa Yogananda’s “Autobiography of a Yogi”, chapter 45. There Yogananda recounts his visit with this extraordinary woman saint. Thus, notwithstanding her sick and painful temporary earth body, this saintly being continued to identify as, and to experience and emanate Divine bliss. And those of us blessed to be near her were unforgettably enveloped and blessed by that transcendent shakti life-force energy which she radiated. Never in this realm do I recall being enveloped by more intense Divine shakti than that which I then experienced. Another unforgettable Indian pilgrimage shakti experience happened at Dakshineshwar, the long-time residence outside Calcutta (now Kolkata) of Shri Ramakrishna Paramahansa, famed 19th century Indian holy man and priest of the Kali temple there. From this experience I was reminded that Divine shakti is not dependent on physical presence of its source. Before visiting Dakshineshwar I knew nothing about Shri Ramakrishna, nor of his spiritual consort ‘Holy Mother’ Sarada Devi. As we entered the Kali temple enclave our spiritual tour leader and guide, Sant Keshadavadas, briefly told the tour group about how Ramakrishna had become “enlightened” by unrelentingly propitiating the Divine Mother as Kali, the temple deity, and ultimately threatening suicide if She did not grant him her darshan. This was the first time I’d heard that story. The Kali temple was closed to visitors when our group arrived. And we had limited time scheduled there. But for a while we were able to walk around the vast temple enclave and its buildings. In one of those buildings I entered a room where for many years Ramakrishna had slept and given darshan to numerous visiting devotees, including Vivekananda. Though until then I’d known nothing about Ramakrishna, on entering Ramakrishna’s room I experienced his shakti energy with an inexpressibly intense and unprecedented feeling of déjà vu. Though almost one hundred years had passed since Ramakrishna’s August 1886 mahasamadhi, his marvelous life-force shakti still pervaded that holy place. Mysteriously, that room felt so comfortably familiar to me that it seemed I could happily remain there forever. Other tour companions walked in and out of that room. But I didn’t want to leave. Only with great reluctance as our tour was about to depart Dakshineshwar did I exit that place, and its unforgettably familiar shakti. Because of that mysterious harmony and familiarity I became intensely curious about Shri Ramakrishna, and soon began reading about his life and his wisdom. Ultimately, of all the saints whose stories I have reflected on, I came to feel most intuitive affinity with Ramakrishna and with Saint Francis of Assisi, both of whom were extraordinary exemplars of Divine devotion. Though Francis had lived seven hundred years before Ramakrishna in a vastly different age and culture they had similar traits with which I have felt great rapport. Even before meeting Guruji, I began having synchronistic inner and outer experiences concerning Saint Francis of Assisi, of whom I was previously ignorant. Because of those experiences I developed deep affinity with and great curiosity about this legendary saint. And I began and have ever since continued daily recitations of the “make me an instrument of Thy peace” prayer associated with him. Prior to my pilgrimage to India, I was already so inspired by Saint Francis that I regarded him as an archetype to be emulated. But I was unable to satisfy deep intuitive curiosity about ‘Francesco’ until ten years after that Indian pilgrimage. Then on 1992 retirement from legal practice, I traveled to India and later to Italy to pay respects to Sri Dhyanyogi and to Saint Francis of Assisi. In Assisi I experienced unforgettable déjà vu, like that experienced at Dakshineshwar. But unlike my brief visit to Dakshineshwar, I spent over a week in and around Assisi, with intense and tear-laden emotion of devotion. 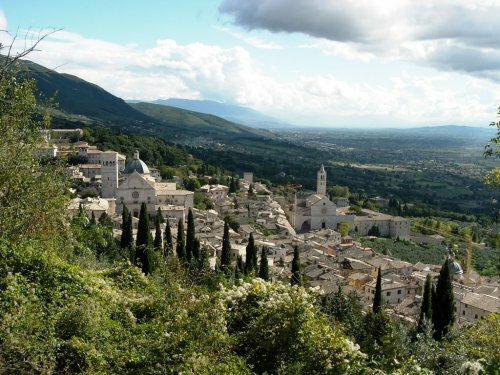 During that visit I had a few of the most memorable spiritual experiences of this lifetime, which I have recounted at https://sillysutras.com/2013/10/pilgrimage-to-assisi-communing-with-saint-francis-rons-memoirs/. I arrived at the Rome airport on a Spring evening in 1992. After sleeping that night at an airport hotel, the next morning I rented an auto and drove north toward Assisi. Instead of taking the fastest autostrada route, I elected a slower scenic route. After a few hours I came to a sign announcing that I was entering Assisi. Immediately after the sign there was a rightward road bend whereupon I beheld a vista of my intended destination – the beautiful Umbrian town of Assisi, where St. Francis was born and resided for most of his extraordinary life. Almost immediately thereafter I was obliged to pull off the road, in a turnoff place. I couldn’t drive further because I began crying spontaneously and intensely, with deep emotion sparked by a mysterious feeling of déjà vu that I had returned to a beloved and familiar place. Only after shedding many tears was I able to resume driving to my destination – the Ananda Spiritual Retreat Center in the Umbrian hills outside Assisi – where I stayed during my pilgrimage there. The Ananda center had been founded by Swami Kriyananda, a prominent direct disciple of Yogananda, who in Autobiography of a Yogi referred to St. Francis as an “apostle of humility”. So, it seemed an ideal place for me stay as a “born-again Hindu” devotee of St. Francis. After sleeping my first night at the Ananda center, the next day I drove into Assisi. With continuing déjà vu I walked through medieval streets of that lovely town experiencing a sweet and mysteriously familiar ambience. Then I visited the giant Basilica of Saint Francis, under which the great saint is entombed. Near the crypt containing his remains there were continuing Masses being celebrated consecutively in various languages for pilgrims from places worldwide. As a secular Jew transformed to “born-again Hindu”, who spoke only English, I had never before participated in a Catholic mass. However, irresistibly I attended several consecutive masses in various languages which I didn’t understand. But my heart knew the pervasive sweet and familiar ambience which I had experienced outside the Basilica, and which had become intense for me near Franceso’s tomb beneath the Basilica. And I was compellingly drawn to it. 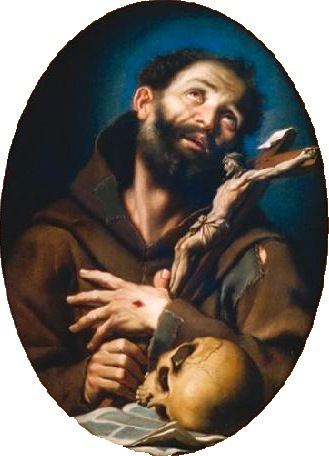 Eight hundred years after Saint Francis had walked in that lovely Umbrian town it seemed for me that it was everywhere still pervaded by his sweet life-force shakti; with its emanation being especially intense at the site of his entombed remains. I will recount in another chapter how afterwards I unforgettably experienced that same familiar life-force emanation at other Assisi shrine places. My experience with these great saints attests to their timeless Divine life force shakti persisting beyond death; that birth and death are virtual while Life is perpetual. “My whole life has been changed by the touch of one of these divine men.” . . .
Later, after his 1902 mahasamadhi, Vivekananda appeared in subtle vision to Guruji at a pivotal time in Guruji’s sadhana – before his self realization. Vivekananda blessed him, and assured him of spiritual success. Soon thereafter Guruji discovered Vivekananda’s book on Raja Yoga which became of great importance to Guruji’s sadhana. “Can you coax your mind from its wandering and keep to the original oneness? Can you let your body become supple as a newborn child’s? Can you cleanse your inner vision until you see nothing but the light? Can you love people and lead them without imposing your will? Can you step back from your own mind and thus understand all things? Human Body – A Precious ‘Prison’? Eastern spiritual paths identify human incarnation as an extraordinarily precious opportunity to evolve – beyond that of any other life-form; Buddhist and Hindu teachings say that for enlightenment it is better to be born human than even in a heavenly realm. Before my mid-life spiritual awakening, I self-identified only with my body/mind and its story. Though I cherished my health, I was totally unaware of esoteric evolutionary perspectives about preciousness of human incarnation. But, since realizing that I was and am much more than my body and its story, I have deeply reflected on the significance and purpose of a human lifetime. My 1976 realization that I was not my body or its thoughts, but pure awareness, followed a prior out of body experience [OOB] and sparked an amazingly intense ‘rebirth’ process, with convulsive crying, hyperventilation and spasmodic bodily movements. Immediately after that realization/rebirth process I briefly experienced myself not as pure consciousness but as meridians of flowing life-force energy, like those corresponding to ancient Chinese acupuncture teachings. Then I soon returned to “normal” bodily consciousness, but with greatly enhanced vital energies which continued for several months. Thereafter, with great curiosity sparked by these new experiences, I began wondering about the nature and importance of the human body. And, synchronistically, I gradually learned with interest about body-work disciplines like massage, acupuncture, chiropractic, osteopathic, and various mind-body bio-energetic therapies. All these therapies aimed to stimulate or release flow of ‘trapped’ or blocked life-force energies. 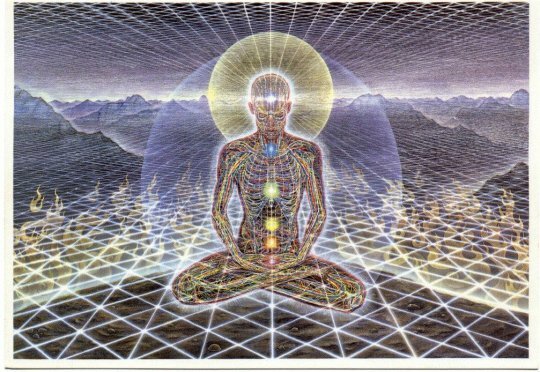 I realized that my intense rebirth experience had temporarily released for me a previously unimaginable flow of vital energies (chi or prana), which gradually had abated as I returned to ‘normal’ consciousness. So, I became highly motivated to again access that hidden reservoir of vital energy. Thus, before meeting Guruji I had received chiropractic manipulations and had several sessions with a Reichian therapist to enhance and balance vital body energies. But I had not again experienced the extraordinary vitality which immediately followed my rebirth experience. Then, after meeting Guruji and observing his amazing physical prowess, even as a centenarian, I learned that he received frequent massages from very few close disciples, which supposedly enhanced his physical well-being, while blessing those privileged disciple/masseurs who in touching his body experienced direct transmission of his extraordinarily intense and powerful cosmic life-force energy (“shakti”). I began wondering about the relationship, if any, between Guruji’s regular massages, his extraordinary physical condition and his amazing ability to transcend ‘normal’ physical limitations. Then, while Guruji was staying at my apartment, just before his 1980 return to India, I had an unforgettable synchronistic experience with him that related to my mind/body questions. One weekend morning when I was home from work, I was invited for the first and only time to give Guruji a massage – a rare blessing and privilege. 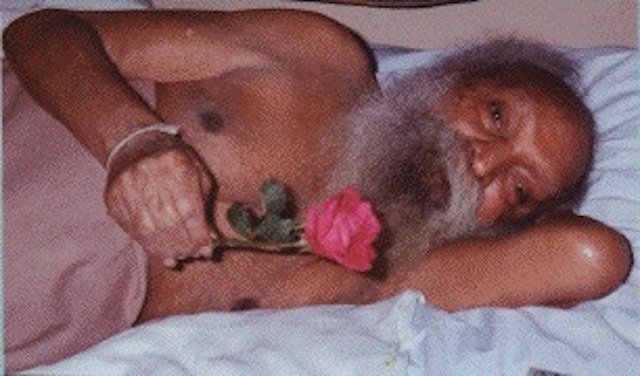 As I began massaging Guruji’s then 100 year old body, I was astonished at its flexibility and softness. I became and remained intensely curious about Guruji’s revelation that my body was like a prison. I wondered how and why ‘I’ was ‘imprisoned’, and how ‘I’ could get out of ‘jail’ – free like Guruji. Was I imprisoned by body stiffness from subconsciously stored traumas? It was apparent that my body was not supple like Guruji’s body. Though half his age, I couldn’t even sit with crossed legs, much less stand on my head or perform the other advanced yogic postures (asanas) that Guruji demonstrated. As I remembered the extraordinary vitality which temporarily followed my rebirth “peek” experience, I intuited that it was a glimpse of a potentially achievable bodily state well beyond anything I had theretofore imagined. But how could I restore that state? And even if possible, would the restoration of such a state allow me to get out of prison at will, like Guruji? That remained a mystery. Gradually and synchronistically, I have been given insights about the bodily ‘prison’ mystery, but haven’t yet ‘solved’ it. I realized that all phenomena and forms – including human forms – that appear in this space/time reality interdependently originate in subtle energy planes pursuant to mysterious laws of causality. And I remembered that even though Guruji had evolved beyond limits of ordinary human consciousness, he had remained in a human body, but with amazing ability to transcend ordinary physical limitations, only because of his unselfish desires to help others. Whereas it was obvious that I was ‘imprisoned’ by bonds of ego desire and ignorance mentioned by Sri Yukteswar. Though at first – longing to be merged with the Divine – I fervently aspired to transcend all physical and subtle desires, I came to realize that my aspiration was in itself a subtle desire. So, intuitively I began with ever increasing heartfelt faith in universal Awareness – the Tao – to surrender to the mysterious Infinite – “to let go, and go with the flow”. Deeply inspired by the Buddhist Bodhisattva ideal of altruistically helping all beings end their sufferings, I gradually stopped trying to transcend this world. But with ever growing gratitude I began accepting my life as a cherished evolutionary opportunity; an opportunity to be in my precious human body in a compassionate and loving way which – at subtle levels – might help all life everywhere. And the more I have gratefully accepted my human incarnation, the greater has been my happiness and the more I have experientially and synchronistically learned from this precious human life. Though I always cherished and appreciated good health, more than ever before I have become mindful of my bodily needs for appropriate nourishment, exercise, and rest, and have tried to satisfy those needs in a natural way. And remembering that subtle life-force energies are the genesis of every physical form or phenomenon, I have become ever more alert to my thoughts, emotions and attitudes which may influence physical well-being. Though, unlike Guruji, I have not yet transcended subtle desires and ignorance and am still ‘imprisoned’ in my body, I aspire to emulate his wise and compassionate way of being in this world. Recently, for the first time in this life, I have even started treating my body to regular massages. Who knows, maybe some day I’ll be able to report to you the massage that ‘sets me free’? While gradually becoming interested in Eastern spiritual ideas, I persisted in trying to understand scientifically my continuing unexplained metaphysical experiences. So I subscribed to Psychic Magazine and looked for other possibly relevant writings. Then, synchronistically, I found and read with tremendous interest and fascination a medical case study book by Lee Sannella, MD, entitled: “Kundalini-Psychosis or Transcendence” about an esoteric psychophysiological transformation process long known to Indian yogis and adepts but not to Western medicine; a process initiated by awakening of dormant ‘kundalini’ life force energy at the base of the spine. The book defined the kundalini process as an “evolutionary process taking place in the human nervous system”. As I read therein medical case studies of fifteen different people undergoing the kundalini process, I realized that I too had been experiencing that process since my April 1976 spontaneous rebirth episode; and, that the kundalini process might explain some of my ‘weird’ new experiences. Some of the many extraordinary psychic phenomena which I was then experiencing, I associated with India. Perhaps the most surprising and memorable of these experiences happened one night while I was fast asleep in my studio apartment. In the middle of the night, I was suddenly awakened and sat up in bed with open eyes in the completely dark room. Before me, I beheld in startled amazement the clear image of a woman’s face and upper torso, wearing a head scarve common to Hindu women. But instead of appearing in life-like colors the woman’s image was all luminous gold. Next, the golden female image was replaced by another amazing image; in its stead, I beheld my own clear image also in luminous gold, as if the Indian woman’s golden image had morphed into mine, or as if my image had emanated from that of the Indian woman. It was especially startling for me to be viewing in front of my physical body, my own luminous image. Since beholding those extraordinary golden images, I have wondered why they appeared and their significance, if any. I can not yet say why I so beheld my own image. But ensuing events seemed to resolve the puzzle of why I had seen an image of an Indian woman when I then knew no Indian woman and hardly anything about Indian culture. I later learned of the importance in Hinduism of the Divine Mother conception and of various deity forms representing it. Foremost of those deities was Shakti – believed to manifest through female embodiment and fertility – while also existing in males as unmanifest infinite potentiality. In ensuing years, I met various well known adept Indian female spiritual teachers considered embodiments of Divine Mother. And I learned that Vedic scriptures declare Shiva and Shakti to be inextricably associated with each other in this phenomenal world, as the male and female aspects of the Divine. The goal of the kundalini yoga transformative process is ascent of activated Shakti life force energy from the base of the spine to the highest energy vortex (or chakra) atop the cranium where – in the pinnacle of human experience – Siva and Shakti merge in Divine illumination. 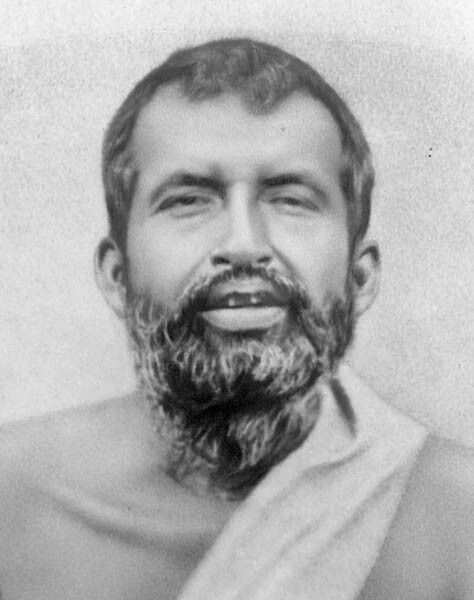 Renowned 19th century mystic saint Ramakrishna Paramahamsa – with whom I later felt great affinity – legendarily worshiped Divine Mother as Kali, who revealed Herself to him as a “a limitless, infinite, effulgent Ocean of Consciousness” only after he threatened suicide if She did not appear. Thereafter, Ramakrishna taught that God is both formed and formless and can appear to the devotee either way. 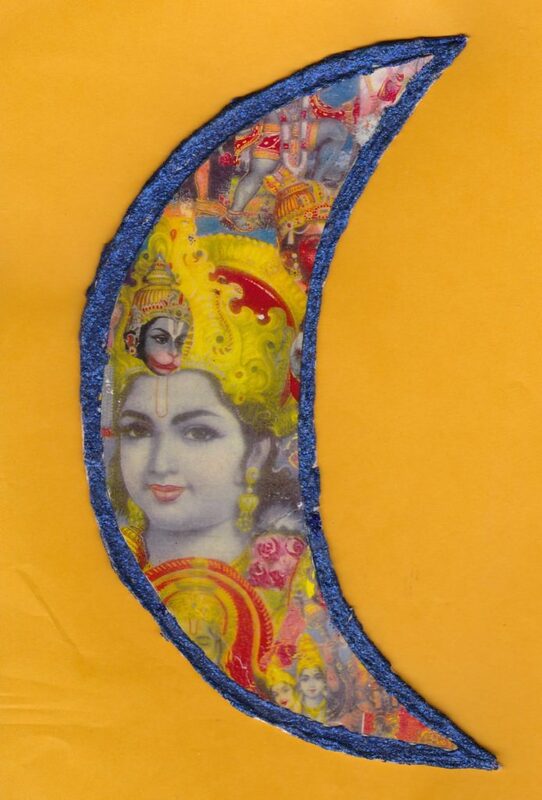 Apart from these unforgettable golden image visions, also suggestive of India had been my spontaneous and continuous recitation in Hawaii of “Rama”, an Indian name of God, and the unexpected appearances of Mahatma Gandhi as my first spirit guide. Later I had repeated inner appearances of an elderly man with a beard who didn’t look like a modern Westerner, but like an Indian. I had not yet begun any meditation practice. But, before retiring I would often close my eyes in quiet contemplation and sometimes see ‘inner pictures’. One of those inner pictures which kept recurring was the somewhat blurred form of the same elderly bearded Indian man. 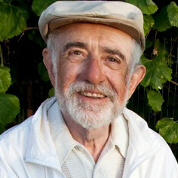 To satisfy my curiosity about why I was having these inner experiences, and about the esoteric kundalini process, I wanted to meet Dr. Sannella, who practiced in the Bay Area as both a psychiatrist and ophthalmologist. So, on learning that he was a principal officer of the California Society For Psychical Study, I joined the society and began attending its bi-monthly meetings, where I met him. One evening in early April 1978, I attended a regular meeting of the San Francisco Psychic Society. As I entered the room, I saw a poster announcing a forthcoming series of meditation programs at the University Christian Church in Berkeley. The poster featured a prominent picture of an elderly man with a gray beard. (See photo below.) As the meeting progressed, I irresistibly kept looking at the poster. Something about the picture of the old man fascinated me. After the formal meeting concluded, I asked Dr. Lee Sannella about the the pictured meditation teacher and announced meditation programs. He told me that this would be a very rare opportunity for “darshan” of an Indian master yogi, Shri Dhyanyogi Madhusudandas, with power to activate and guide the Kundalini transformation process. I took a printed flyer with details of the schedule and decided to attend the first of the announced meditation programs. A crucially pivotal new life phase was about to begin. I was about to evolve spiritually from being a secular Hebrew, to becoming a “born-again Hindu”.